It’s been a long time since I’ve blogged about KDE Telepathy, we’ve got so much going on that we’ve had to delay the release so we can get everything perfect. Here’s a sneak preview of all the new stuff in this release. Assuming you have had an application called TpLogger installed all your messages have been logged, only without a way to view them. Now in 0.4 I wrote a log viewer to see them all. Merging Kopete logs is a work in progress, but it is being thought about (but probably not for 0.4). 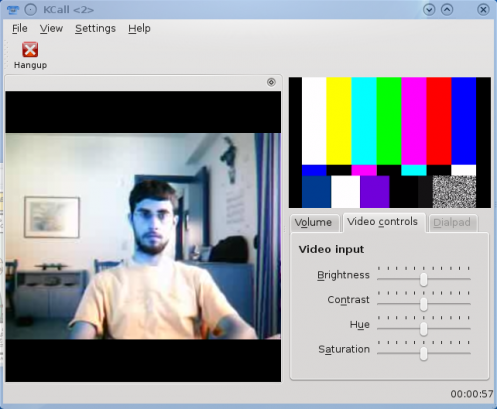 As Lasath Fernando blogged previously we have a plasmoid for handling chats. Since that blog Lasath and I have changed the behaviour slightly so that all new incoming chats open directly in this plasmoid (if installed) then there’s a button to pop out to the full blown text interface if needed. 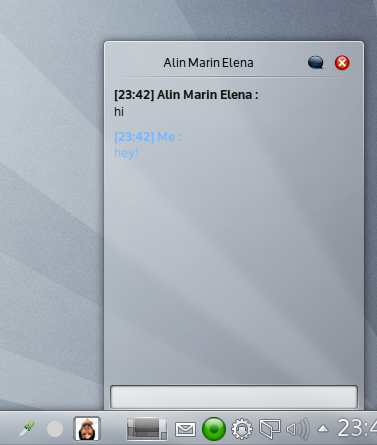 It acts as a far more advanced notification interface, through which you can reply. 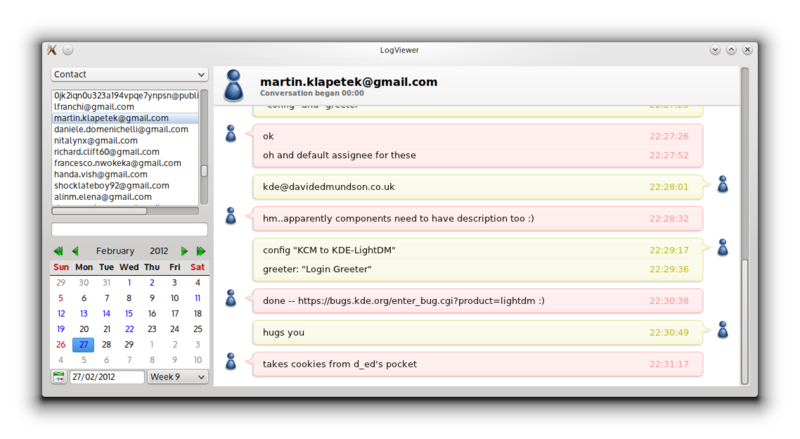 It’s very much like the GMail web interface, but integrating with your desktop. It also contains several fixes since it was first announced. This is a new addition to our features, this was originally started as a small part of a GSOC project by Francesco Nwokeka last year. It’s since been tidied up to a proper Declarative Plugin and really simple QML. What we’re doing with all our new plasmoids is buliding nice-reusable declarative plugins and keeping our plasmoids are very desktop oriented. Plasma Active can then redo this in a very touch oriented way only redoing the GUI layer. We still really need some design inspiration on ours though. 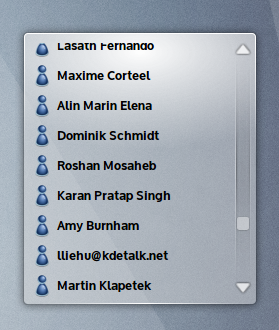 Dan Vratil has written a KRunner plugin for KDE Telepathy allowing you to quickly search for your contacts and start chats, it’s now passed our rather rigourous code reviews and heading into our repositories! Whilst we’ve been developing these new features, we’ve also been fixing little issues elsewhere; bugs and crashes to the small UI details. Daniele Domenichelli has made some massive improvements to the Adium Theme support in the main text view, amongst all sorts of other fixes. All the pieces towards working video are coming together thanks to the amazing work of George Kiagiadakis, so hopefully we can get video in this release. Don’t count on it, and it’s not quite ready for testing yet. The release was originally scheduled for late March, however to get all these features perfect we are delaying the release slightly. You can see in the screenshots things are a bit rough round the edges so it’ll be ready when it’s ready, but we’re aiming for around April/May. Absolutely! Attracting attention is the only reason I write these posts :). We have a load of tasks that need doing, and not just coding. The contact list applet above needs a lot of designing, a mockup in photoshop/equivalent would be amazing. We still need more testers who report and triage bugs, and there’s jobs for everyone. Plus we’re a cool group to hang out with, honest. Head down to #kde-telepathy on Freenode to find us. Contribute to our beer fund! This will be spent at Akademy and future sprints and split across all the members contributing to the project to buy us all a well deserved beer. We all work on this purely in our free time with little compensation so it’s things like this which keep us going.